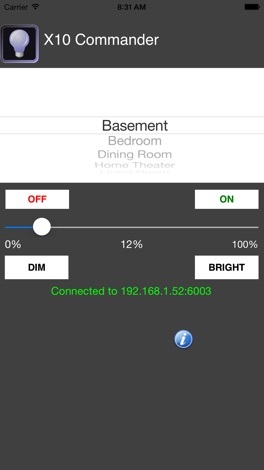 X10 Commander is an X10 Controller Client for the iPhone/iPod/iPad and is a native iOS application that allows you to control X10 devices anywhere in your house. Ever wanted to close the garage door while lying in your bed? How about turn the outdoor floodlights on but didn't feel like walking back downstairs to turn them on? Now you can! All you need is an X10 CM11, CM12, CM15, CM17 Firecracker, or CM19 device connected to a server piece which runs on your computer (Mac,PC,Linux) and X10 Commander will allow you to control all your X10 devices. X10 Commander consists of two pieces...a server piece which runs on your computer (Mac,PC,Linux) and the client piece which runs on your iPhone/iPad/iPod. The purpose of this program is simple: to allow control of your X10 devices from your iPhone/iPod/iPad with the touch of a finger. 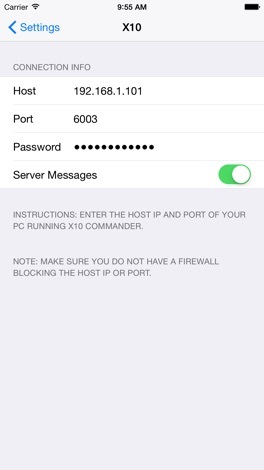 * Control your X10 devices from your iOS device. * You are already using X10 Devices and already own an iDevice so now you can take it to the next level. * Costs less than 1 X10 Home Appliance!